I grew up in a whitewater family and don’t remember my introduction to whitewater. Not remembering it has driven me to think about helpful ideas to share with others when introducing kids to whitewater. Here are some of the don’ts and dos that I have found helpful when instructing kids. 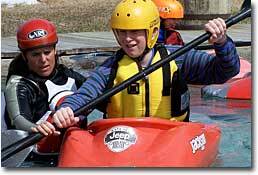 I am often asked how old should kids be before taking them rafting or kayaking? When should I teach them to roll? Can they use my equipment until I am sure they like it? All kids are different, but I hope these pointers will get you all in the water enjoying rivers for a lifetime together. Winter is a perfect season to go to hot spring pools or swimming pools to let kids use kayaks as pool toys and help them become accustomed to helmets and lifejackets. Once kids know how to swim they are ready to play in the pool. They have a ball floating in their lifejacket, climbing into the cockpit of a kayak, becoming comfortable when it tips over with them and learning to hold their breath and swim under the water. I like to flip the kayak over and show kids how to swim under and come up in the cockpit for a breath of air. My friend calls this game “caving with kayaks.” Once they are comfortable, they will beg for a paddle and begin racing from end to end of the pool. It’s empowering for kids to be able to direct their kayaks and makes them much more comfortable when they are asked to tip over on purpose or when you introduce different strokes to them. When the weather warms, the next great place to take kids paddling is a local lake or pond in which they’ve played before. Since they became comfortable wearing their helmet and lifejacket in the pool, the only new experience will be different water. Kids will usually ask when they are ready for another challenge. This is a great time to ask them if they would like to practice wet-exits with a sprayskirt on. Make sure you use a loose skirt that they can put on and take off without much effort. A one-tug skirt is a must! Also, using a skirt with a loose tunnel is great as sometimes kids forget to pull their skirt and wiggle out instead. It seems like they will wet exit perfectly and then the tenth time they will forget, panic for a second and then wiggle out. No harm done as long as they can wiggle out. I use NRS Basic Nylon Skirts when teaching wet exits. Once they are comfortable with wet exits and hanging out upside down before they wet exit, they are well on their way to their next challenge. Taking the times to do a “million” wet exits makes kids comfortable with the water and their kayak. Then they are usually ready for easy rivers. I often have kids paddle inflatable kayaks down a stretch first or paddle with me in the Dynamic Duo two-person kayak from Jackson Kayak before they paddle their own boat. This takes the pressure off of them and allows them to view their next step without the worry. My best advice is not to rush the progression from here. They will tell you when they want to learn to roll. Once they do, you know they are ready to learn their roll and paddle the easy river with a skirt! I think it is best to hire an instructor or enroll kids in group kayak instruction once they have expressed interest in learning to roll. It is very powerful for kids to see other kids rolling. It is great to start two kids together from the beginning! Encourage a friend to come along to the pool. It is very important that they have a kayak that is outfitted so they stay in the kayak but is not too snug. Make sure there is a little wiggle room. Many kids programs have kayaks for rent. Yes, the right size of boat and paddle is important. Enjoy the progression and know that it will pay off when you’re running the river together and having a blast. The first combat roll will be as exciting as the first wet exit! 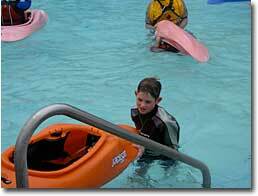 Whitewater play parks offer a safe place to paddle and work on the fundamentals. Enjoy this winter at the hot springs and pools with your kayak. 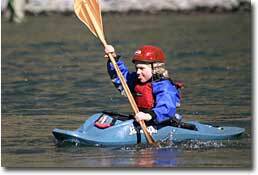 Also, don’t forget the snow; a kayak makes a great sled and offers one more fun way to get acquainted with kayaking! Enjoy this video. You can send questions about introducing kids to kayaking to devobarker at yahoo dot com. Enjoy the progression, don’t rush it and above all, have fun.